DUMBARTON came close to taking all three points when they faced Ladbrokes Championship runaway leaders Hibs at Easter Road. 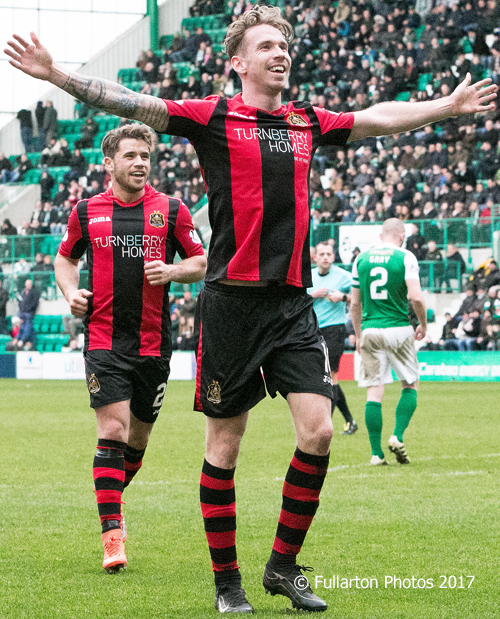 DUMBARTON came close to taking all three points when they faced Ladbrokes Championship runaway leaders Hibs in front of a 14.039 crowd at Easter Road. A spirited performance saw the visitors take the lead twice, but they could not hold out for what would have been a memorable victory in a very exciting game. Sons survived 25 minutes of first half pressure with Hibs enjoying the vast majority of possession. But on 35 minutes, the home side went behind when Christian Nade converted a penalty following Andy Stirling being bundled over on the left side of Hibs penalty box by Marvin Bartley. Sons almost doubled their lead five minutes later, but Daniel Harvie's 20-yard free kick just evaded the inside of the post with keeper Ofir Marciano scrambling. Alan Martin saved superbly on 48 minutes stopping a powerful James Keatings shot, but nine minutes later Hibs managed to get back on level terms. A drilled John McGinn cross was turned into his own net by Daniel Harvie, but the young defender could do nothing about it. Dumbarton scored again on 62 minutes to regain the lead. A Nade knock down found Robert Thomson (pictured) who hit the ball into the bottom corner from 18 yards. Hibs were awarded a 70th minute penalty, but Martin saved superbly from Keatings. On 83 minutes Hibs made in 2-2 following a mix-up in the Sons defence, Martin Boyle the scorer. Neither side could find a winner in the closing minutes.